If you’ve got assets and equipment, odds are you have a maintenance routine. But every routine could be better — and in your search for betterment, you’ve likely come across the acronym CMMS. 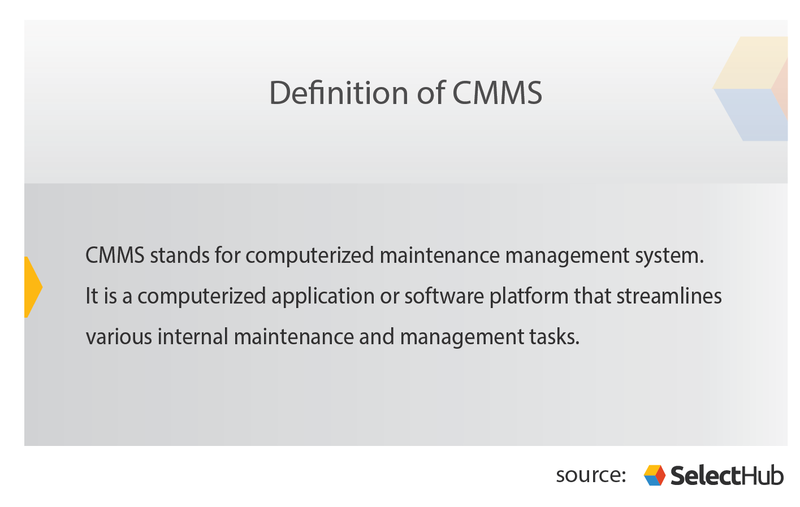 But what does CMMS stand for? Why does it have other names like EAM and FM? If you’re a little confused, no worries. We get it, and we’re here to help! So what is CMMS software? CMMS stands for computerized maintenance management system or software, depending on who’s answering. In other words, it’s a computerized system (aka a piece of software) that streamlines the management of various maintenance tasks and operations. Keep in mind that CMMS is only for internal maintenance — if you’re looking to maintain client equipment and manage your on-the-go operations, you’ll want field service management software. A CMMS system helps manage equipment, inventory and entire maintenance teams at a single location or across global organizations. It offers a combination of work order management, inventory management and maintenance scheduling features that cover all the bases for any organization with facilities, machines or other assets that need maintaining. 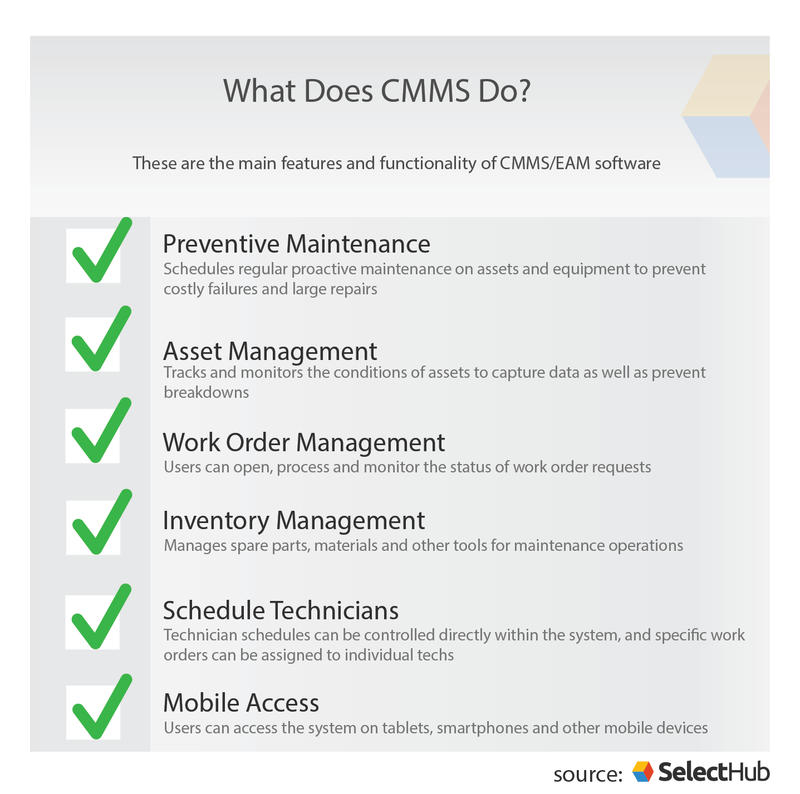 Maintenance departments typically use CMMS as their main maintenance software, as it covers a wide range of functionality, but others can opt for an enterprise asset management system (EAM) or facilities management (FM) software if they have specialized needs. What Is CMMS Used For? One of the most important tasks for a business with heavy equipment or machinery is preventive maintenance. Nobody wants to experience extended downtime of an important asset when it could have been prevented with a little preventive upkeep. In order to help businesses get proactive with their preventive maintenance, a CMMS system schedules regular preventive maintenance to be performed on any and all assets that need it.  Additionally, CMMS preventive maintenance software can connect with and “talk to” your various assets. Using the Internet of Things, sensors connected to your equipment can detect when issues arise, both major and minor. This creates an alert that automatically goes out to the necessary parties so you can address the issue right away. This is another proactive measure to ensure that your equipment continues to run smoothly. Preventive maintenance isn’t the only way to protect your assets. The asset management features of a CMMS allow you to track various data points related to all of your assets. Some of the more basic data it tracks includes purchase dates, warranty information and asset specifications. But the more powerful data that a CMMS system tracks include expected lifetime and service history. The service histories of your assets in particular are important. This keeps a record of every bit of maintenance performed on an asset, so you know when and if maintenance occurred. In addition, you can use this information to predict when issues will arise. Analyzing the service history data may also reveal patterns in certain issues, such as a part breaking down every 10 months. In turn, you can plan your maintenance accordingly. One of the most crucial CMMS platform features is work order management. The digital realm is always better for organizing and storing work orders than pen and paper. You never want to lose track of your work orders; especially not your recent ones. This type of software’s work order management features drastically reduce the possibility of losing track of your work orders since they’re all stored within a searchable database. When you log in to a CMMS, you can view the status of all your work orders, such as which are yet to be started, which are in progress and which are done. In addition to simply tracking maintenance, you can also see who was assigned to each work order and whether or not it has been completed. After all, it’s useful to know who’s responsible for a poor maintenance job, as well as who’s responsible for an exceptional one. A CMMS isn’t a substitute for a standalone inventory management system. However, the inventory management features available in a CMMS are still quite useful. While an inventory management system maintains inventory control over products and other items that are distributed from a warehouse, CMMS inventory management manages your spare parts. These parts are the ones used to repair and perform maintenance on your equipment and other assets. The worst thing that can happen during maintenance is realizing that you’re out of a part that you need, resulting in extended downtime. CMMS inventory management automatically tracks how much of each part you have left, and alerts you when you get below a predetermined threshold. This way, you can order more spare parts before you run out. Maintenance managers can also use a CMMS to schedule their maintenance team. As anyone who’s created a schedule manually can attest, it’s a time-consuming and difficult process. A CMMS helps automate the process by scheduling maintenance workers for not only shifts, but specific tasks during their shifts. With an automated schedule, maintenance managers can rest assured that every maintenance activity will get done when it needs to. Users can set CMMS systems to send out scheduled maintenance alerts when different triggers occur such as an interval of time, a component failure, warranty expiration, etc. This takes some of the burden of remembering to schedule maintenance off of administrative staff. Almost everyone in the modern age constantly has their face buried in their phone already, so you might as well continue the trend with business software. I’m kidding — but the convenience and versatility of mobile CMMS systems do warrant some discussion. Cloud-based CMMS typically come with mobile capabilities so you can take the system with you wherever you go. Although we doubt anybody would access their CMMS on their mobile device for pure entertainment on their off hours, it’s incredibly useful while on the job. With mobile CMMS, maintenance managers that oversee multiple facilities can jot down notes directly into the system, no matter which facility they’re at. Mobile access is also convenient for a maintenance worker or manager that works at a single facility. Without it, any notes or maintenance updates that need to be made in a CMMS have to wait until they’re in front of a computer. When they have mobile access, however, they can update work orders as they complete them and write down maintenance notes while they’re doing it. This also opens up options for company-owned tablets or similar devices to ensure security and ease-of-access. Enterprise asset management, or EAM software, is used mostly for asset management. The main goal of an EAM is to extend the life cycle of your equipment in order to maximize your ROI. It does this through a variety of methods including depreciation method calculations, tracking mean time between failures (MTBF) and more. More often than not, EAM software is used to manage large, expensive pieces of equipment that would create a high cost if the turnover rate gets too high. Historically, EAM and CMMS were very different. Where CMMS performed only general maintenance management, EAM was associated with more advanced analytics and management features. However, as CMMS became more advanced, it began to offer the same features as EAM software. Now the two are often used interchangeably today: that’s why you’ll see EAM platforms on our CMMS leaderboard, and vice versa. Both could be equally useful to your organization, so make sure not to count a platform out without doing research. Computer-aided facilities management, or CAFM software, is a type of CMMS that — surprise! — focuses on the management of your facility. Also known simply as facilities management or FM software, it helps plan and manage everything about a facility, including the processes that go on inside it. For example, some CAFM systems let you remotely control windows, lights and thermostats to save energy or prevent break-ins. More commonly FM software offers features such as property maintenance, life cycle management and space utilization/resource allocation. Asset performance management is considered by many to be the next step after EAM in the evolution of asset and maintenance management systems. Its goal is to improve the availability and reliability of assets while mitigating operating costs and risks. This is more of a future step than a current one, but any savvy business person should keep an eye on this rapidly growing area of CMMS. These features of computerized maintenance management systems all add up to several big bonuses for your organization. They help your technicians stay organized with breakdowns of responsibility and maintenance appointment reminders. Users can track and manage tools or equipment, reducing the likelihood that they will be lost or damaged. Overall, the goal of CMMS is to help users calculate expenses, manage maintenance, track assets and allocate resources more efficiently. CMMS can come in a variety of pricing packages from open source to premium, so there will always be a system that fits your budget and your needs. CMMS can also be deployed in multiple ways — this means that CMMS systems can be hosted either on-site at your location via hardware, hosted in the cloud via the vendor’s servers, or a combination of the two. These advantages will only continue to grow: CMMS is marching towards the future in a number of innovative ways. From artificial intelligence to the IoT to asset performance management (APM), the future of CMMS will continue to bring advancements and innovations to the field of maintenance management. To sum up, CMMS software is a maintenance management platform that helps users streamline maintenance, asset management, inventory and work order processes. It replaces paper-and-pen tracking, punch cards, or Excel spreadsheets and combines those processes with internal messaging and other useful features in a single convenient interface. Now you should be able to answer the question “what is CMMS” confidently and thoroughly! If you do have any more questions, please leave them in the comments and we’ll do our best to address them. That’s really nice that CMMS software will let you set up shifts and also set specific tasks for your employees to do. I’d think that this would be really helpful if you had people coming in at all sorts of different times and had very flexible scheduling. It seems like CMMS software would be really helpful to get and start utilizing both for the employer and employee.